Osteoclasts are multinucleated cells of hematopoietic origin and are the primary bone resorbing cells. Numerous osteoclasts are found within the synovial tissue at sites adjacent to bone, creating resorption pits and local bone destruction. They are equipped with specific enzymes and a proton pump that enable them to degrade bone matrix and solubilize calcium, respectively. The synovial tissue of inflamed joints has a particularly high potential to accumulate osteoclasts because it harbors monocytes/macrophages, which function as osteoclast precursors, as well as cells that provide the specific molecular signals that drive osteoclast formation. Osteoclasts thus represent a link between joint inflammation and structural damage since they resorb mineralized tissue adjacent to the joint and destroy the joint architecture. Practically all disciplines in medicine are exposed to trends, which focus on a certain aspect of a disease while other aspects attract less interest. Rheumatology is not spared from such gradients in scientific interest. When reviewing rheumatology, it appears that research interests time-dependently switch from one topic to another, as if they represent television programs selected by the remote control of the scientists of the field. B cells comprise one example; these had been of particular interest after the detection of rheumatoid factor as an autoantibody in rheumatoid arthritis (RA) decades ago, before entering a sleep mode during the phases of intensive T cell and cytokine research. Later, B cells were rediscovered as a potential target for B-cell depleting antibodies to treat RA and have regained scientific interest. Osteoclasts have shared a similar fate, but the lag time for the rediscovery of osteoclasts in the synovial tissue took more than 100 years. Theodor Billroth gained his honor and reputation by introducing new operating techniques that enabled the effective treatment of serious ulcers of the stomach and the rescue of patients from lethal gastrointestinal bleeding. As a typical feature of doctors during these times, Billroth was not addicted to surgery but was also interested in other fields in medicine, especially anatomy and pathology. When reading the slides of tissue sections derived from joint surgery of patients with inflammatory arthritis, he observed giant cells at the interphase between inflammatory tissue and bone. He termed these cells "bone breakers" based on the appearance of microscopic sites of bone resorption (lacunae) adjacent to these cells . His contemporary chairman of pathology, Anton Weichselbaum, first described the appearance of local bone erosions in RA (at this time termed fungous synovitis because of the fungous-like appearance of the synovial inflammatory tissue) and characterized these lesions as caries of the joint ends . These two findings did actually represent a very detailed and informative description of structural damage in RA: a special giant-like cell type populates chronically inflamed joints, appears to resorb the bone and creates localized skeletal defects within the inflamed joint. This finding was basically the 'end of the show' for the osteoclast in RA until its rediscovery and comeback in the late 1980s and much more detailed studies in the late 1990s. Until then, osteoclasts were not attractive enough to compete with the rise of immunology, the discovery of antibodies, the insights in cellular immunity and the rise of molecular biology in the field of immunology. Osteoclasts are the primary bone resorbing cells and are essential for the remodeling of bone throughout life . These giant cells are a fusion product of up to 20 single cells, also called a syncytium. Osteoclasts enable the shaping of bone architecture in early life, remodel the skeleton during adulthood and pave the way to bone loss during old age. Osteoclasts have two pivotal molecular machineries that allow them to resorb bone (Figure 1). One of these is a proton/protein pump, which is molecularly characterized as a vacuolar ATPase. This pump creates an acidic milieu between the metabolically active part of the plasma membrane of the osteoclast, the ruffled border, and the bone surface. This acidification allows the cell to solubilize calcium from the bone matrix. The second includes special matrix degrading enzymes, such as matrix metalloproteinases and cathepsins, which cleave matrix molecules such as collagen type-1 and thus remove non-mineralized substances from bone. These two specificities allow osteoclasts to invade bone and create a resorption pit, which can latter be filled up by osteoblasts synthesizing new bone matrix. Based on these attributes (polykaryons, proton pump and high enzymatic activity), osteoclasts are highly specialized cells that are particularly designed to degrade bone, a job that cannot be done by other cell types in a similar manner. Osteoclasts are not found at places where no mineralized tissue is present. Generation of these cells occurs only in the vicinity of bone, suggesting that mineralized tissue provides key differentiation signals. Osteoclasts are hematopoietic cells stemming from the monocytic lineage that undergo a series of differentiation steps until they ultimately end up as activated osteoclasts, which stick to bone and start resorbing it. Osteoclast invading bone. Osteoclasts are multinucleated cells that resorb mineralized tissue. This image shows osteoclasts that have created a resorption lacuna. The cells are stained for tartrate-acid phosphatase (TRAP; top) and for the calcitonin receptor (CT-R; bottom). Normally, osteoclasts are found at the surface of the trabeculae of cancellous bone, where they create resorption pits. These pits are then repopulated by osteoblasts refilling these sites with new bone matrix. Osteoclasts are also active in cortical bone, which is remodeled on the basis of thin bone channels that harbor osteoclasts and osteoblasts. Besides this physiological situation, osteoclast-mediated bone resorption can be enhanced systemically, leading to increased bone resorption and bone loss as found in postmenopausal osteoporosis. Aside from these systemic changes, local accumulations of osteoclasts also trigger bone erosions. Two clinical conditions are typical examples of this form of local bone loss: skeletal metastasis of tumors and arthritis. Thus, malignant plasma cells in multiple myeloma, transformed mammary gland epithelial cells in breast cancer and inflammatory tissue in RA all induce the local formation of osteoclasts, which then triggers local bone erosion (Figure 2). Early structural damage in arthritis. Osteoclasts are part of the synovial inflammatory tissue (arrow), which invades mineralized cartilage (double asterisk) and bone (hash symbol). The single asterisk indicates unmineralized cartilage. Arrowheads mark the bone erosion. Synovial inflammatory tissue is the source of osteoclasts in RA. In the 1980s, Bromley and Woolley identified cells with multiple nuclei, a ruffled membrane, positive acid phosphatase and ATPase in the majority of samples of knee joints derived from patients with RA . All these features are typical characteristics of osteoclasts and the authors concluded from their findings that osteoclasts populate the inflammatory synovial infiltrate. Based on their localization, Bromley and Woolley termed them 'chondroclasts' when attached to the articular cartilage rather than to subchondral bone. Final identification of these cells as osteoclasts was done in the late 1990s, when Gravallese and Goldring from Harvard Medical School molecularly characterized these cells as osteoclasts . Importantly, multinucleated cells in the synovial tissue express the calcitonin receptor, which is specific to osteoclasts and only expressed in later stages of osteoclast differentiation. 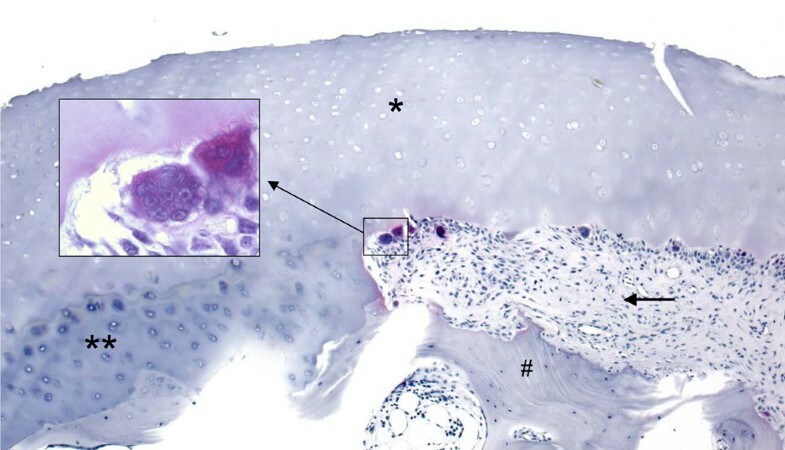 Expression of the calcitonin receptor was thus only found at sites where the inflammatory synovial tissue was in direct contact with the bone surface, suggesting that final differentiation to osteoclasts depends on direct contact with mineralized tissue. Apart from this late-differentiation marker, early-differentiation markers for osteoclastogenesis, such as cathepsin K and tartrate-resistant acid phosphatase, are also expressed in the synovium of RA. These markers indicate the formation of osteoclast precursors, which are mononuclear cells that have entered osteoclast differentiation and are to undergo fusion with polykaryons. These cells also accumulate at sites close to the bone surface, although they are not strictly dependent on direct contact with the bone surface. Notably, cells of the osteoclast lineage carry monocytic differentiation markers, such as CD68, identifying them as hematopoietic cells and distinguishing them from mesenchymal cells such as synovial fibroblasts. This is important since synovial fibroblasts have some characteristics that are known to be typical features of osteoclasts, for example, the expression of molecules such as cathepsin K or the vacuolar ATPase . Whether this 'aberrant' expression of osteoclast differentiation markers on synovial fibroblasts allows them to resorb bone to some extent is unclear and is not supported by data from animal models with defective osteoclastogenesis [7–9]. However, these feature may contribute to the invasive properties of these cells towards articular cartilage, which is a well-described feature of synovial fibroblasts derived from the joints of patients with RA . Key molecules for osteoclast differentiation are macrophage colony stimulating factor and RANKL, which are both expressed locally in the synovial tissue of RA patients, enabling full differentiation of osteoclasts [11–14]. These essential molecules receive additional support from pro-inflammatory cytokines, such as tumor necrosis factor (TNF), IL-17 and IL-1, which themselves drive osteoclast formation [15–17]. RANKL is a molecule with structural homologies to TNFα, but it engages a receptor on the surface of monocytes (RANK), which drives them into osteoclastogenesis. Importantly, expression of RANKL is regulated by pro-inflammatory cytokines such as TNFα, IL-1, IL-6 and IL-17, which are abundant in the synovial membrane of RA patients and increase RANKL expression. In fact, RANKL is upregulated in experimental models of arthritis as well as human RA and psoriatic arthritis [11, 12, 18, 19], suggesting that RANKL is a key driving force of osteoclast formation in the joint. Expression of RANKL is found on mesenchymal cells such as synovial fibroblasts but also on activated T cells, which constitute a considerable proportion of inflammatory cells in the synovial membrane. Thus, there appears to be a tight interplay between inflammatory cytokines, RANKL expression and osteoclast formation in the joint. Another key mediator for osteoclast formation is TNFα. It is not only an inducer of RANKL expression and, thus, indirectly promotes osteoclast formation but also directly binds to osteoclasts through TNFα-receptor type 1 [15, 20]. The concomitant presence of TNF thus potentiates the effect of RANKL and boosts osteoclast formation. This dual role of TNFα on osteoclast formation is an attractive explanation for the influence of TNFα on bone structure and the high efficacy of TNFα-blocking agents in the protection of bone structure in patients with RA. Signaling through TNFα-receptor type 1 involves mitogen-activated protein kinases (MAPKs) and NFkB, which then activate key transcription factors for osteoclast formation, such as c-fos of the activator protein-1 family or NFATc1. Activation of p38MAPK, for instance, is highly important for the differentiation of osteoclasts . In vivo activation of p38MAPK has been observed in the inflamed synovial membrane of arthritis and deregulation of p38MAPK increases osteoclast formation and promotes a more severe destructive phenotype of arthritis . In line with these molecular interactions, systemic overexpression of TNF leads to enhanced formation of osteoclasts, severe osteoporosis and erosive arthritis in mice . 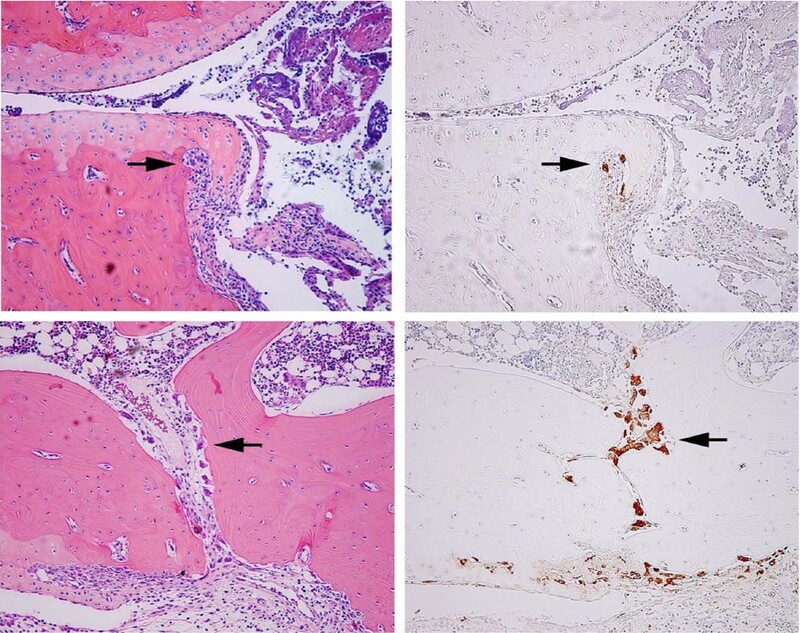 Moreover, TNF influences the trafficking of osteoclast precursors within the body, allowing an accumulation of Cd11b-positive monocytes within lymphoid organs, such as the spleen, which then can home to the inflammatory sites . Since osteoclasts are found in the synovial membrane of all relevant RA animal models, such as collagen-induced arthritis, adjuvant-induced arthritis, the serum transfer model of arthritis as well as mice transgenic for human TNF, the effects of targeting these cells using genetic as well as pharmacological approaches have been intensively studied during the past years. From these models it is evident that osteoclast formation is an early and rapidly occurring process that starts right from the onset of arthritis and leads to a fast resorption of the juxta-articular bone (Figure 3) . Experiments that have induced arthritis in osteoclast-free models, such as c-fos knockout mice  or mice deficient in either rankl or rank, have shown that osteoclasts are essential for joint destruction [8, 9]. In these models, no osteoclasts can be built up, which not only results in osteopetrosis but also in a complete protection of the joint from bone damage. 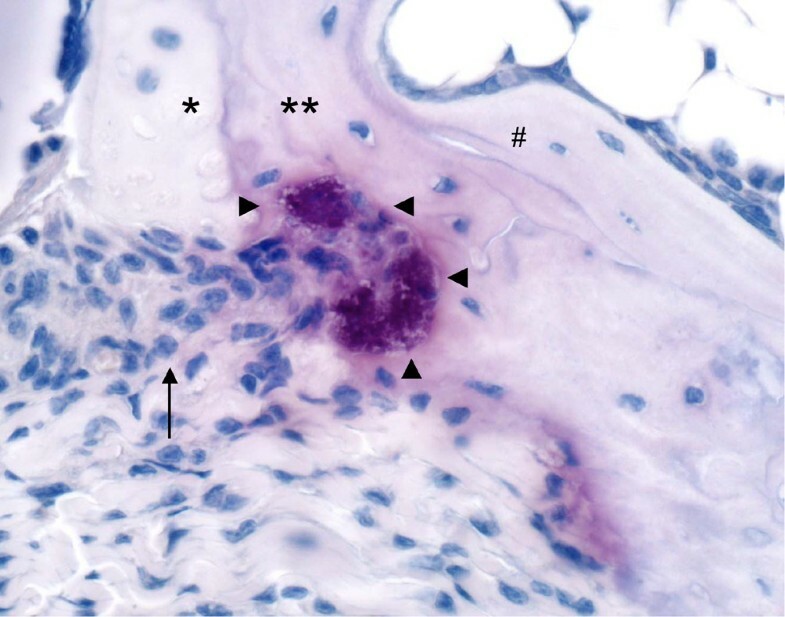 Inflammatory signs of arthritis are not affected by the removal of osteoclasts, suggesting that osteoclasts are strictly linked to bone damage but not to the inflammatory features of arthritis. Very similar results were also obtained with therapeutic administration of potent bisphosphonates like zolendronic acid and osteoprotegerin, a decoy receptor and thus negative regulator of RANKL [16, 25–29]. In all models, administration of osteoprotegerin results in an almost complete protection of the articular bone and disappearance of osteoclasts from the inflamed synovium [16, 26–29]. In contrast, inflammation is not affected by the inhibition of RANKL. Thus, inhibition of osteoclasts in arthritis appears to particularly affect the onset and progression of structural damage in the joint. Accumulation of osteoclast precursors upon induction of arthritis. Osteoclast precursors are rapidly built upon induction of arthritis in mice. This shows the junction zone as well as Haversian channels in cortical bone one day after onset of arthritis. Osteoclast precursors are stained brown for cathepsin K expression as shown in the right panels. The left panels show corresponding hematoxylin eosin stained sections. Arrows indicate bone erosion. Virtually all clinical studies on anti-inflammatory and immunomodulatory drugs for the treatment of RA have not only used clinical endpoints as efficacy measures but also radiological endpoints to define their effect on structural damage. This is attributable to the current concept that the clinical picture of RA as a debilitating joint disease is composed of chronic inflammation as well as accumulation of structural damage. This concept is reflected by the fact that bone erosion is part of the diagnostic criteria of RA and has become a valuable tool for monitoring the disease [30–34]. It soon became evident that bone erosion starts early in disease and progresses most rapidly during the first year . These findings have fostered the concept that retardation, arrest or even repair of structural damage are central goals in the treatment of RA. It is also driven by the strong association between increased radiographic damage and poor functional outcome in patients with RA [33–35]. Structural damage in RA results from a complex process that involves bone erosion, cartilage degradation and the inflammation of the tendons close to joints. Cartilage also includes unmineralized cartilage, which builds the surface of the joint. This structure is not a target of osteoclast-mediated joint damage because osteoclasts do not affect non-mineralized tissue. 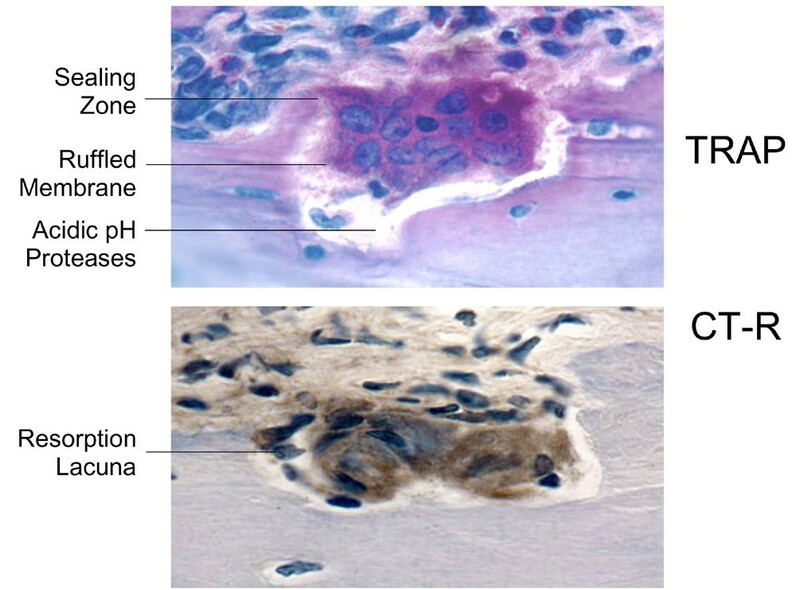 In fact, investigation of samples from joint replacement surgery has revealed that osteoclasts do not invade unmineralized cartilage, suggesting that other mechanisms lead to its degradation (Figure 4). Although the molecular mechanism of degradation of the surface cartilage of the inflamed joint is not fully understood, a combination of the invasive properties of the synovial tissue and the expression of degrading enzymes such as matrix metalloproteinases are likely to be the key players in cartilage damage . Underneath the surface cartilage, however, is a layer of mineralized cartilage, which connects it to the subchondral bone. Erosion of mineralized cartilage by osteoclasts. The image shows a section through a metocarpophalangeal joint of a patient with rheumatoid arthritis. A deep invasion into mineralized cartilage (double asterisks) by synovial inflammatory tissue (arrow) harbors osteoclasts at the front of the erosion. Unmineralized surface cartilage (single asterisk) appears intact, whereas subchondral bone (hash symbol) shows resorption lacunae. Mineralized cartilage is usually as thick as unmineralized cartilage and is particularly sensitive to osteoclast-mediated bone resorption. This is quite conceivable since the most abundant pathway of ossification, enchondral ossification, is based on the removal of mineralized cartilage and its remodeling into bone. Thus, the mineralized cartilage is actually a weak point in the joint, which allows osteoclasts to invade properly and to undermine the surface cartilage. These tunnels are then filled by inflammatory tissue, the pannus, which allows the inflammatory tissue to build up a forceps-like structure around the remaining surface cartilage, which then faces rapid degradation due to direct exposure to high levels of cytokines and matrix-degrading enzymes. Invasion into mineralized cartilage also paves the way for breaking the subchondral bone barrier, which is only a thin barrier, allowing synovial tissue to gain access to the bone marrow. Osteoclasts populate the synovial membrane of patients with RA and psoriatic arthritis. As these cells are specialized to destroy mineralized tissue, osteoclasts are of central importance in the structural damage of chronic inflammatory joint disease. The unique functions of osteoclasts rely on special molecular properties that allow selective targeting of these cells by specific drugs. Osteoclasts are dependent on the presence of RANKL, which is an essential signal for osteoclast differentiation. Whether RANKL inhibition is effective at protecting human joints from inflammatory damage remains to be elucidated. Currently, the best-studied drug interfering with RANKL is a neutralizing human antibody termed denosumab (formerly AMG162), which is highly effective at suppressing bone resorption within days of administration [36, 37]. Other molecular targets of osteoclasts are cathepsin-K, a matrix degrading enzyme, the matrix-binding molecule αvβ3 integrin and the vacuolar ATPase that creates an acidic milieu to remove calcium from bone [38–40]. Whether targeting these with potential drugs would be effective in stopping structural damage in inflammatory arthritis remains to be elucidated. A recent clinical study on the structural effects of new potent bisphosphonates in RA suggests a good rationale for osteoclast inhibition in RA . However, intensive therapy with very potent bisphosphonates may be necessary since osteoclast formation itself is not affected by these agents, which primarily target the resorptive properties of these cells . It is important to state that therapies currently in use for the treatment of RA, such as TNF and IL-1 blockers, interfere with osteoclast formation. Particularly, TNF blockers show profound bone sparing effects in arthritis, which suggests that these agents interfere with osteoclast formation in addition to inhibiting synovial inflammation. This is in line with the observation that TNF blockers can even slow bone erosion in the absence of a major clinical response . Whether other targeted therapies such as rituximab or abatacept similarly affect osteoclast formation is unknown. Both agents reduce the signs and symptoms of RA and they also show effects on joint structure. The latter effect may either be an indirect one through lowering joint inflammation or is based on a direct inhibition of the osteoclast. Current and future concepts of treatment of chronic arthritis will thus combine an optimal inhibition of inflammation as well as structural protection. Interference with osteoclasts could thus be an important tool to optimize the structural protection of joints and may allow maintaining long-term protection of joint structure during inflammatory disease. This review is part of a series on Cells of the synovium in rheumatoid arthritis edited by Gary Firestein. This work was supported by the START prize of the Austrian Research Fund and the Interdisziplinäres Zentrum für Klinische Forschungproject Erlangen (project C5) of the Deutsche Forschungsgemeinschaft (DFG).